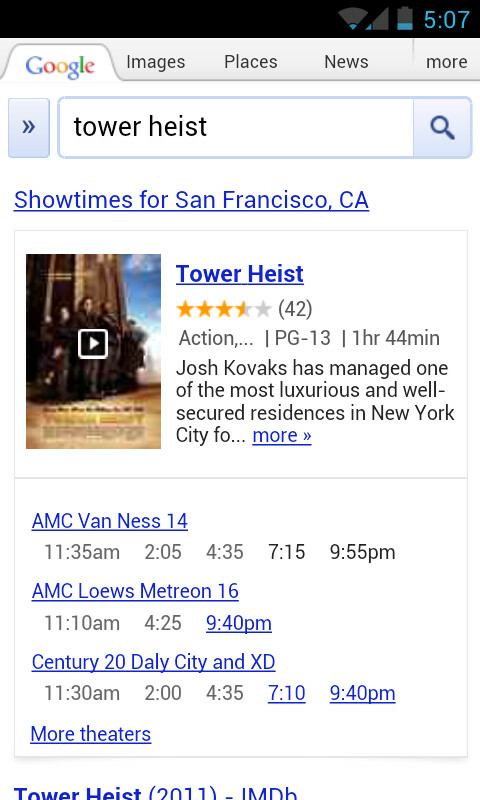 Google has improved its mobile search function that now allows users to quickly find movies, theaters, start times and more. The new service is available for iOS and Android devices. 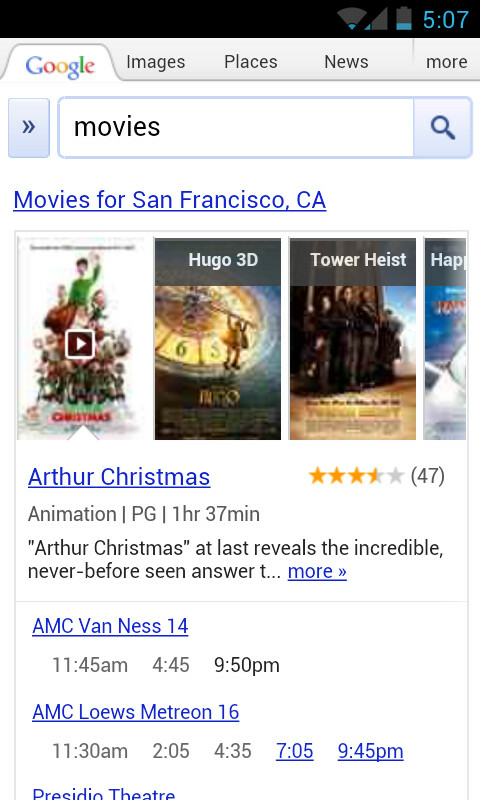 Search for a specific movie or theater and you will see a ribbon on top of the results page with movie posters that you can swipe. Underneath the posters is information that might help you determine which movie you are going to see, and which theater and at what time you will be going. The result is a very intuitive service. When you swipe on the movie posters at the top of the screen on your iOS or Android mobile browser, the information underneath changes to reveal pertinent information for the movie whose poster is at the far left of the screen. Click on the poster to see a trailer of the film, read viewer reviews of the movie, and get start times for the movie at theaters nearby your current location. The new system lets you go through a number of movies quickly without having to wait for a page to load for each film you are interested in. 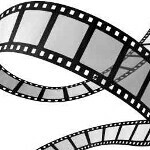 All you need to do is scroll through the posters until you find a movie you want to see. Once you've found a movie you want to see, check the start times. If it is underlined, it means that you can save even more time by purchasing tickets directly from your phone. This new feature works when you search for a movie title or theater and is available in English only, for U.S. Google users. 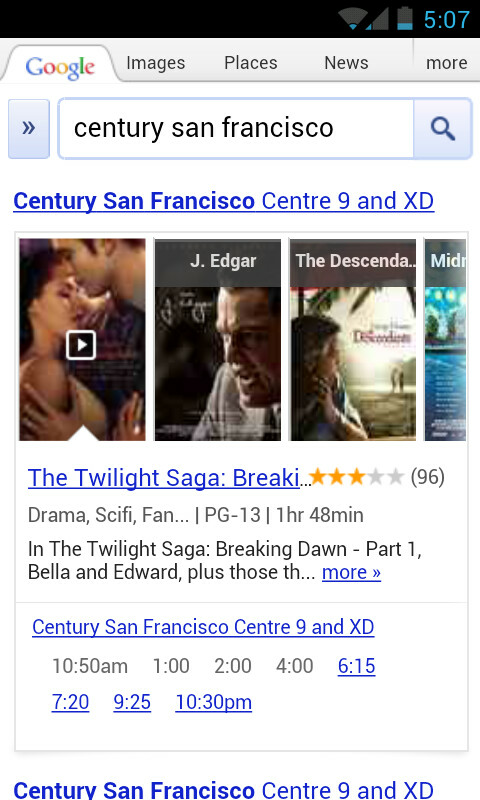 Google will be competing in this arena with movie-based apps like Fandango and Moviefone. Now it will be easy for me to search for my favorite movie. I hope this neat feature will be available soon worldwide.